New Delhi: The government on Tuesday announced a series of steps to revive exports amid disruptions to supply chains arising from the implementation of the goods and services tax (GST). Fresh export incentives to labour intensive sectors and services that will cost the exchequer Rs8,450 crore annually were announced as part of a mid-term review of foreign trade policy for 2015-2020. Also announced were a series of steps to improve the ease of doing business for exporters by cutting red tape and automating more processes. The Union government is pursuing a two-step strategy. In the short run, it is offering sops to exporters, while in the long run, it is looking to improve the competitiveness of Indian exports by raising productivity of exporters, especially in the supply chain through the implementation of GST and improving the ease of doing business. These measures are expected to benefit sectors including leather, readymade garments, handcrafted carpets, agriculture, telecom and hotels and restaurants. The foreign trade policy announced in 2015 had proposed to double Indian exports of goods and services to $900 billion by 2019-20, a steep target given that exports have grown marginally in the last three years. Exporters are facing a severe liquidity crunch because of delayed refunds in the new GST regime. The review of the foreign trade policy, initially scheduled to be released on 1 July, was delayed to compensate for any impact of GST on exporters. 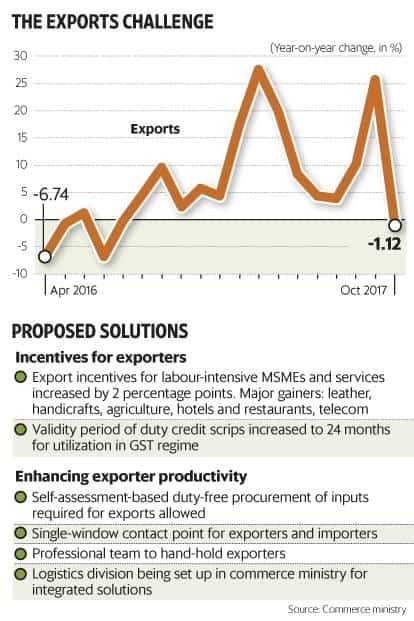 The revised policy proposes an additional two percentage point incentive for labour-intensive sectors such as leather, readymade garments, handicrafts and agricultural and marine products under the merchandise exports from India scheme. Similar incentives were also announced for services. The scheme provides incentives in the form of duty credit scrip to the exporter to compensate for any losses on payment of duties. Commerce and industry minister Suresh Prabhu said the review aims to promote exports by simplifying processes, boosting support to high-employment sectors and leveraging benefits of GST, apart from helping double farmers’ income. “We will constantly review the policy. We do not need to wait two-three years to make changes," Prabhu said. The mid-term review proposes to set up a single point of contact at the Directorate General of Foreign Trade for exporters and importers. It also proposes to set up a logistics arm in the commerce ministry and a trade analytics division for data-based policy actions. The policy also proposes to increase the validity period of duty-free credit scrips to 24 months from 18 months to enhance their utility in the GST framework and seeks to remove the levy of GST on these scrips. Further, goods which are freely importable can be re-exported. Finance secretary Hasmukh Adhia assured exporters on Tuesday that the government is constantly taking steps to address troubles faced by exporters, including alleviating working capital shortages due to delayed refunds and problems in filing tax returns. The government has already announced many steps to alleviate the liquidity challenges faced by exporters. On 6 October, the GST Council decided to re-introduce the pre-GST era Advance Authorization/Export Promotion Capital Goods/100% Export-Oriented Units schemes to allow exporters to procure inputs from local and foreign suppliers without having to pay taxes. The move was aimed at preventing cash balances of exporters getting pre-empted due to upfront payment of GST on inputs. The council also directed field officers to facilitate quick refunds to exporters. An e-wallet is also proposed to be set up to address the liquidity problems faced by exporters. “The steps announced will help in resolving some of the problems faced by exporters but much more needs to be done to increase the competitiveness of Indian exports," said Ajay Sahai, director general and chief executive officer of Federation of Indian Exports Organization. “The steps taken to facilitate ease of trading are welcome," he said.